If for no other reason, go and see “Sculpture of Ancient Mexico” because this subject is no longer just part of Mexican ancient history, but is now also considered as part of an American cultural movement that more and more embraces the contributions of Latin America. This exhibition, which has a museum feel to it, includes twenty-four Pre-Columbian terracotta figures from the cultures of Nayarit, Jalisco, Colima, Veracruz and the Yukatan. There are some extraordinary individual pieces among them. One is a sculpture dating from between 1150 and 550 B.C. 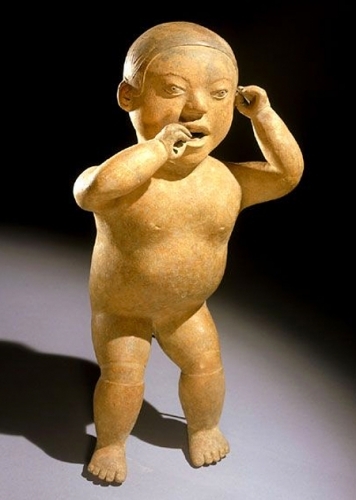 titled “Xochipala Baby,” which shows a young child with one hand grabbing its ear, the other touching its mouth. It seems to be discovering the world for the first time from a standing position. Its face and features give the sculpture a mysterious and unsettling quality. The show also features a large Veracruz “Figure of a Priest,” dating from between 450 and 650 A.D., in a ceremonial dress that leaves his body rather bare. His belt is made of round shells. He’s wearing earrings, a necklace and a nose ring. Instead of looking blessed and sweet-natured, he has a pent-up expression: his eyes are wide open, his lips are pressed tight together and his left hand is poised in mid-motion.